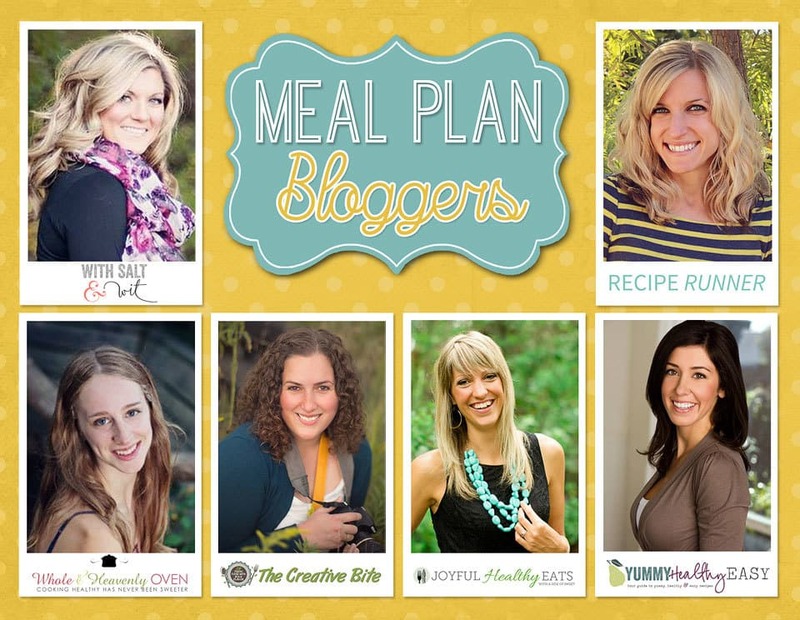 Hey, hey meal planners!! Welcome back to that time of the week when we all drool over our meal plan noms for the week! This week is gonna be insanely delish, FYI. Get those tastebuds at the ready…. As always, be sure to stop back every Saturday for your weekly fix of daily entrees as well as a breakfast, lunch, snack and dessert! Just click on the photo or link to see the recipe. If you are looking for a great tool to organize your weekly meal plans, check out this meal planner ! Soup is one of the stars of the fall but this Crock Pot Potato Corn Chowder with Roasted Poblanos is gonna take the cake! It’s full of bold flavors, easy to make, gluten free, dairy free, and has BACON! Shredded chicken coated in buffalo sauce and topped with a creamy blue cheese coleslaw. These easy to make slow cooker Buffalo Chicken Tacos with Blue Cheese Coleslaw are perfect for a weeknight dinner or serve them up on game day! These sweet roasted peppers are loaded with bold Mediterranean flavors including ground lamb, feta and lemon and topped with crunchy toasted pine nuts. It pairs perfectly with a side of creamy tzatziki! Roasted in a flavorful lemon garlic Parmesan sauce and lots of little mushrooms and green beans, this baked salmon is a breeze to throw together for a weeknight dinner and is packed with SO many amazing flavors! Thai-Style Peanut Chicken Cauliflower Rice Wraps are a Starbucks copycat but with a heavy dose of veggies! Chicken, carrots, cabbage and crispy cauliflower rice all wrapped up and served with an addicting Peanut Coconut Sauce! Sweet & Spicy Bacon Wrapped Turkey Tenders are a delicious appetizer paired with a homemade honey mustard for the ultimate game day finger food! This easy four ingredient meal also makes a great dinner idea with a side of rice and veggies. Loaded Cauliflower Mac and Cheese is a delicious guilt-free take on a classic! Cauliflower tossed in a vegan, paleo cheese sauce and topped with crispy bacon. Protein balls filled with peanut butter, protein powder and oats make the most delicious on-the-go snack! Whenever you need a little protein boost to get you to the next meal, these little bites have you covered! Chocolate Mousse that’s incredibly easy to make with only 5 simple ingredients! Fancy enough for a party but easy enough for a quick dessert any night of the week. Craving cookies for breakfast? Now you can have them without any guilt thanks to these healthy and gluten-free Chocolate Peanut Butter Banana Oat Breakfast Cookies! They’re easy to make and don’t contain any butter, oil, or artificial sweeteners! Chicken salad lettuce wraps lightened up with healthy avocado and NO mayonnaise at all! These wraps are going to quickly become a lunch favorite. Sheet Pan Honey Mustard Chicken & Vegetables a meal that’s healthy, easy, absolutely delicious, only 30 minutes and such an easy clean up!